MMTaskManager is a small and simple task manager that allows you to easily and quickly switch between current running applications. It also allows you to close any selected application or all applications right on your finger tips. In additional to closing applications, MMTaskManager reports how much memory each of the application uses to see which application takes up the most space in memory. 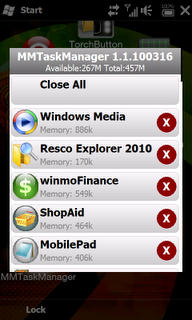 The app also display the total amount of memory your device has as well as available memory.